I thought about whether to post this for about a week, since it was so personal to someone that I know. I've decided to do it, and expect you folks "out there" to treat it with civility, given this is from a woman that I've known for thirty years, and who is the daughter of one of my best friends. Even though I have great confidence in the inherent goodness and common social intelligence of most of you who have been reading the blog for years, I'm not going to name her. There are jerks and trolls out there in abundance. The narrative in brief: this youngish woman had a grade-school-age son, who recently died in a tragic accident. She is one of the tougher-minded persons about warrioring through rough patches in life that I know, but of course this death of her only child was too much for anyone to just shrug off and soldier on unaffected. I don't know how she made it through the funeral [which I attended]. A few days after that funeral, she was alone in her house when she noticed a light on the ceiling. 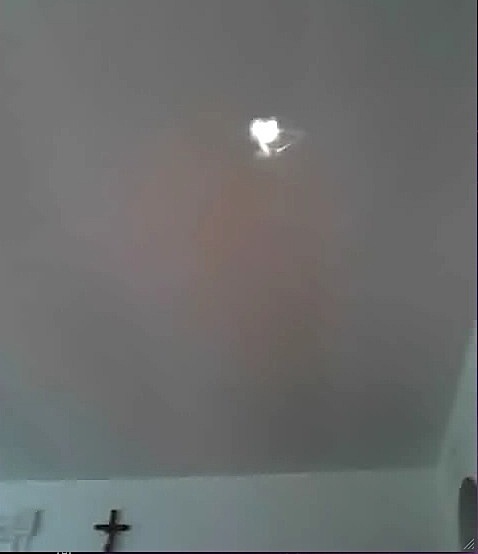 After staring at it for awhile, she decided to get her phone and film it. [as I said, a tough-minded lady]. She filmed the light for about two minutes and then sat the "camera" aside to climb up and investigate more closely. The big deal here was: she could not block the light with her hands. The lightform was on the surface of the ceiling itself and not being "beamed in" from somewhere external. Without the context of her life, we would say only that this was an extremely anomalous light. A snap from the video as it came to me. The lightform stayed centered in the same spot on the ceiling throughout the 2+2 minute camera periods (after coming back down from her "testings" she filmed it for two minutes more, until it faded out --- so, whole experience was about 4minutes filmed and about three minutes elsewise.) Although centering in the same location, the form itself was quite dynamic, changing shape and sending out short streamers. I don't KNOW what this was. The lady involved doesn't know either [as she's said directly to me.] But I know what both our "leading hypotheses" are, and she has taken some consolation from that. Little Aasher Liles – who has Down Syndrome – took the remarkable shot by using his mum Kerri's mobile phone. The apparition resembles the cartoon character Casper the Friendly Ghost. It was only until Kerri took her phone and scrolled through her camera roll to discover the astonishing ghostly figure, which she believes is his "guardian angel". She became convinced that the seven-year-old – who cannot speak – had taken this picture while they were on a flight back to Houston, US. “I don't know if you remember but I called back a few months ago. It was last year during the summer, during your La Lechuza show (June 6, 2017 – he didn't actually call but he did send Clyde an image that he talked about on the show - image shown below). I sent you that photo of that white thing I saw out in the woods and I sent it to you on Ground Zero. I have not figured out what it was and I've sent it to a couple of different people to get it cleared up. Basically what it was, it was moving across the field from left to right. In the middle of the day. It's an old photo from an LGNV so the photo quality isn't very good. (Lewis thinks it looks like an Angel) That's what people say, yeah. It's like an apparition or an angel. In my opinion though, it felt alien, when I looked out there. It didn't make any sound. It was barely moving. So it was inertly moving across the field. (Lewis asks where it's standing) It's just a field. It's just an open field next to a wildlife management area. So when I took the picture, I thought it was like a torso size, maybe two to three feet. Four feet maximum. But then when you started to talk about it last year (Lewis mentioned that he thought it was 7 or 8 feet tall). Do you believe in miracles? 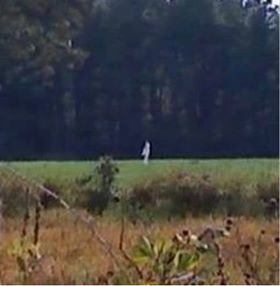 A group of people in East Jordan, Michigan believe they have come across one. A Michigan man could not believe his eyes when he checked his home security system and saw that it had seemingly snapped an image of an angel hovering over his truck during the night. 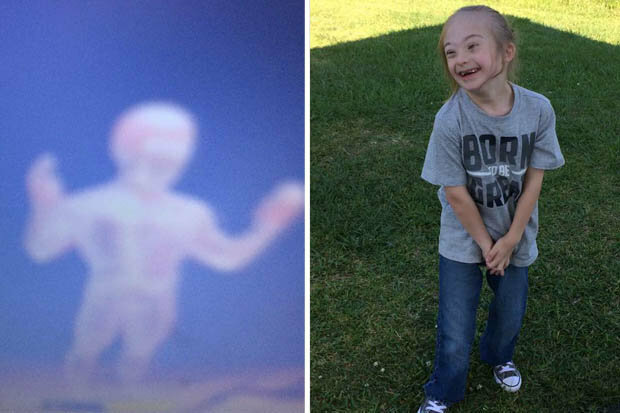 Talking to a local TV station, Glen Thorman recalled gasping "that's an angel" as soon as he saw the remarkable anomaly in the photo taken by the motion sensor camera. His suspicions were strengthened when Thorman conferred with the pastor of his church, Deneille Moes, who declared that "there wasn't any doubt in my mind that we were looking at something supernatural." She subsequently posted the photo to the church's Facebook page marveling, "yep, folks, it's an angel." Moes also mused that "I guess there is no question who is watching over their residence while they sleep." And she assured parishioners that the image was not altered in any way, which is a claim we tend to believe, since we can't imagine why Thorman would want to hoax his pastor with a fake image of an angel. That said, the assumption that the anomaly is an angel is not shared by everyone. A photography expert consulted by the TV station that profiled Thorman and his amazing image had a more down to Earth explanation for what the camera had captured: a moth. Although that could be the case, he did concede that "there may be room for interpretation," meaning that the possibility that it's an angel may still fly. What's your take on the oddity? Let us know at the Coast to Coast AM Facebook page if you think it is spiritual visitor watching over the Thorman family or just a bug. Could be a moth. But sure made an interesting picture! Now that I am actively “planting” outdoors, I become “aware” all over again of how fast insect critters move! I’m still at that point where even small, slight movement gets my attention. I donno. I've heard things first-hand from clients who had run ins with comforting beings. Some were touchingly loving - like the shoeless guy above. A photo of an unusual cloud formation is going viral. "I said, 'that's an angel,'" he said. He took the picture on his cell phone through the windshield of his moving car. He later posted it on his Facebook page. "I have nearly 2,000 shares on my little page," he said. From his post, it was shared on abc13.com, and it took off. A couple driving along the highway in Texas could not believe their eyes when they spotted a cloud formation that bears a striking resemblance to an angel. Danny Ferarro told a local TV station that he and his wife were on their way to an unspecified meeting that they were feeling uncertain about attending. But their misgiving were soon replaced with wonderment when he looked up at the sky and saw a rather massive collection of clouds that looked like an angel illuminated by the sun behind it. To his credit, Ferraro quickly snapped a picture of the astounding sight and subsequently shared it on social media where it has, unsurprisingly, gone viral. Having heard from people around the world with their reactions to the photo, he mused that merely witnessing the cloud formation may have only been a small part of a bigger story. "I'm speechless, honored and blessed," he said, "to have the responsibility of sharing that picture." Skeptics will say that ascribing any kind of spiritual value to a meteorological event such as this is merely wishful thinking and that the shape of the clouds is simply coincidental. However, that doesn't seem to matter to Ferraro and the many others who took solace in the photo. "There are people who lost loved ones, who see it as a sign from God," he marveled. And, at the end of the day, who is to say that it can't be both? This story dates back to 2009, when I was 45 years old and living in a home I owned in Boca Raton, Florida. I am an educated business professional who enjoys reading about paranormal things, but never really had any encounter to speak of. It was early in the afternoon, I had a friend over who was helping out with some electrical work on the second floor. I walked away for a moment down the hall, when all of a sudden I heard a voice whisper directly in my ear "you're going to be arrested." I immediately felt weak to my knees and nauseous, got slightly dizzy. It felt as if something or some energy field had traversed right through me. I swear it sounded as if a person had leaned over and spoke right into my ear, but of course, no one was there. I had no idea what to make of the message or the experience. I sat in my downstairs office, just bewildered by what just occurred. I started to nervously fidget with things, and picked up an old ski mask I had laying there. I don't know why, but I shoved a white paper plate into it, and drew rather angry eyes in its sockets, and leaned it upright against the wall on my desk, staring at it but not aware of a reason why I did that. My friend came downstairs, but I didn't mention anything about what had just happened....frankly, I wouldn't have known how to relate it. Two days later, at about 6am, my doorbell rang. A short young man stood there, and said he crashed into my garbage cans, and if I got a Hefty bag, he'd clean it up. I was half asleep, not cognizant of how weird this was, and made my way to the garage. I hit the door-opener button, the door started to rise, and then I was bum rushed by a dozen camouflaged men pointing M16 machine guns at me. I was tackled to the ground, handcuffed, and dragged out front. Now wouldn't you know it, all of these guys had on ski-masks! In fact, there were about 50 officers from DEA, FBI, and Palm Beach County Sherrifs office, all of them masked. It turned out that a particular individual who I rented a house to in another town had been caught making drugs there, and that low-life told the cops it was my operation, just to save his own skin. They came to my house thinking they were going to find Pablo Escobar or a Walter White type. I wound up spending a night in jail before anyone could get me out and sort out the mess. All charges were dropped, of course, but I think some angel or other-worldly being saw this coming and tried to warn me. Because I didn't have any clue as to what was going on at my rental property and there certainly was nothing going on my own life to validate a fear of arrest, some entity knew it was coming and more or less just told me so. It didn't really help in any way. I will never forget that voice, although it was no one I could recognize. What do you make of this? I've never told anyone of this occurrence. 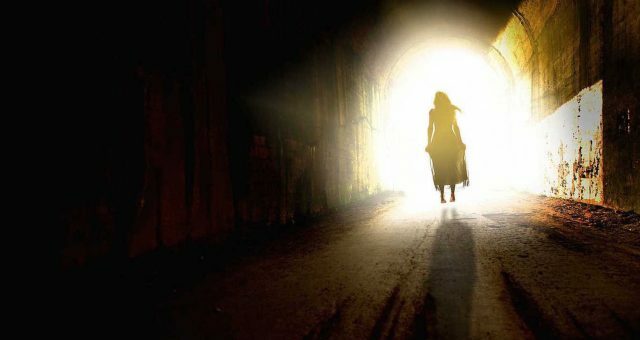 For better or worse (you decide), celebrities have been coming out of the woodwork lately to share their own paranormal experiences. From Kurt Russell describing how he witnessed the Phoenix Lights firsthand ahead of his last space-themed movie release to Rob Lowe sharing his Bigfoot encounter conveniently just in time for his sons’ paranormal hunting reality TV show, the unexplained seems to be in vogue right now and celebrities are taking advantage of it. I do believe in paranoia [sic] activity. … That’s so bad, oh my god. I do believe in that stuff. I think that our personalities and our souls have so much — we’re so much more than just blood vessels and bones and muscle, ya know? And I feel like that it’s quite possible that, in certain situations, when we die — our bodies die — that maybe there’s a spirit capable of continuing on. In certain situations, not all the time. We’ll let “paranoia activity” slide this time, Dale. This time. When I wrecked in the Corvette in 2004 at Sonoma — it caught fire — somebody pulled me out of that car. And I thought that it was a corner worker because I felt somebody put their hands under my armpits and pull me out of the car. I didn’t get out. I don’t have any memory of myself climbing out of the car. And I remember sort of moving like in motion going to lean forward and try to climb out of the car, and then something grabbed me under the armpits, pulled me up over the door bars and then let go of me. And I fell to the ground, and there’s pictures of me laying on the ground next to the car. I know that when I got to the hospital, I was like, ‘Who pulled me out of the car? I gotta say thanks to this person,’ because it was a hand! It was physical hands grabbing me! I felt it. And there was nobody there. Earnhardt says he had a difficult time believing no one had pulled him from the car due to how viscerally he recalled the sensation of someone pulling him from the burning car. Dale Jr. didn’t elaborate on what – or who – might have pulled him from the car, but come on, everyone knows it was most likely the ghost of the Intimidator himself: North Carolina legend Dale Earnhardt. Earnhardt Sr. died in 2001 during the final lap of the Daytona 500, prompting NASCAR to make a series of rule and equipment changes. Earnhardt Jr. even told 60 Minutes interviewer Mike Wallace in 2013 that he believed his father pulled him from the car. Could the ghost of the Intimidator have saved Dale Jr. from a fiery death? This took place in 1909 when my Great Grandfather Harley was 7. He lived deep in the Maine woods with his parents and 2 siblings. Harley’s father was away for a couple of weeks due to his job and it was the beginning of winter. He helped his Mother care for the family home and his younger siblings. One day, he was helping his Mom hang some laundry out in the cold when she fell ill and fainted upon entering the house. Harley did his best to care for her but after a couple days it seemed his family had all become very sick. He was fine. 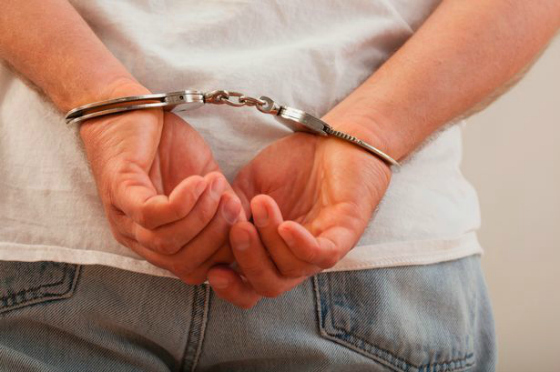 He recalled his mother telling him that he had to take a journey into town to fetch a doctor. The walk was 10 miles or so and he was only 7. He had to be strong as he was the man of the house with his Father gone. He bundled himself up and headed out early in the morning. It was cold and began to snow and Harley started to doubt he could make it. He said the snow started blinding him and his feet were so frozen that it was hard to keep going. Suddenly a friendly dog greeted him and behind him a man. Harley was relieved. The man was very handsome and wore a strange coat that didn’t look warm enough, it looked leather and had fur around the collar. The stranger introduced himself as Finn and asked him where he was heading. He said he was going the same way and they walked side by side through the storm along with Finns dog. Harley said they talked and talked although he didn’t remember what about but he did recall feeling warm and safe and full of energy. The journey flew by and as they approached the small town Harley looked around to see that the dog was gone when he looked back at Finn, he had disappeared as well! They were quite a ways out of the woods and there was nowhere he could have gone to. Harley was confused but soon found someone to speak with. 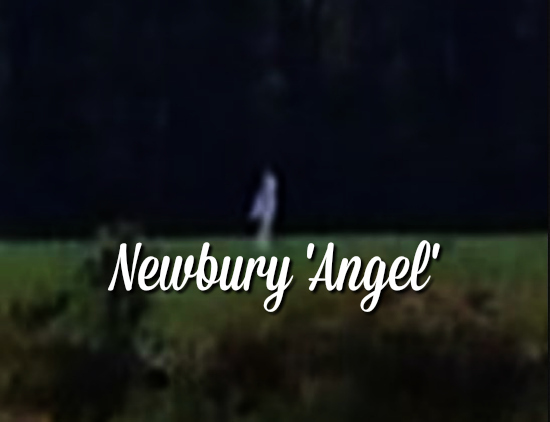 The name itself comes from some of the descriptions of the various young children who supposedly encountered seemingly angelic beings often called “Butterfly People,” with multicolored wings and often surrounded by a shimmering illumination or orbs of light, although descriptions vary. One popular account that probably made the name stick comes from a 2 ½-year-old little girl who was in a car with her father when the tornado came tearing through. Miraculously, although the vehicle was blown clear off the road and tumbled over, the two occupants within were shaken but completely unharmed. The girl would later say that “butterfly people” had been sitting in the car with them, and when she was told that no one else had been in the car she insisted, “No, Daddy! There were butterfly people in the car with us!” Was this the mind of a very young child trying to adequately describe angels or is it the product of a stress addled young mind? Another harrowing vehicular encounter with these beings allegedly happened when a young boy was riding in a truck with his father during the catastrophe when a car came soaring through the air towards them, seemingly bearing down on a direct collision course but somehow managing to veer off at the last moment so that it just barely missed them. The boy would later say that he had seen two “very big angels” hold the car back at the time and throw it to the side. Although only the boy had seen these mysterious figures, the father would admit that there seemed to be no rational reason for why the car should not have smashed right into them. There is also the account of a mother and her young daughter who were also caught in the tornado in their car and managed to crawl out of the vehicle to take refuge in a nearby ditch. The tornado relentlessly approached, destroying all in its path, yet amazingly leaving the two uninjured, and the girl supposedly said to her mother, “weren’t they beautiful? Didn’t you see how beautiful their wings were!” When the mother told her daughter that there had been no one else there, the girl insisted that they had indeed been surrounded by winged angels with rainbow colored wings as the tornado has passed. Other accounts happened right out in the open, such as that of a young boy of about 5 years of age, who was caught outdoors when the tornado inexorably came lumbering through, and although there was much devastation to the area in its wake he was found to be unharmed, with the debris around him arranged precisely so as it just missed him. 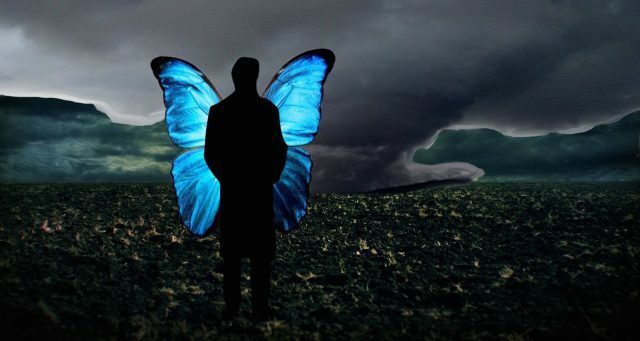 The boy would claim that as the winds roared about him he had seen three glowing figures with “butterfly wings” walking towards him across the field, and that wherever they stood the flying debris would bounce off to the side or disappear. These three winged entities then surrounded him until the raging tornado passed, after which they were described as smiling before vanishing into thin air. A deputy sheriff also apparently told a similar tale, of a 4 year old boy who was found wandering about a field in the aftermath. When asked where he had come from the boy said that he had been at the St. John’s hospital when the tornado had hit, but the the strange thing is that this boy was completely unharmed, without so much as a scratch on him, despite the fact that that hospital had been pretty much leveled and with numerous causalities. When asked how he had gotten away and ended up in this field a full 6 miles from the hospital without injury, the boy simply matter-of-factly stated, “The angels brought me and set me down here.” In yet another such tale a young boy was caught outside with his father, with winds so strong they supposedly ripped the father’s shoes off, yet they came out unscathed, with the boy later saying that “butterfly people” had been hovering over them throughout the ordeal. There are other stories like these as well, such as that of Clay and Melissa Morgan and their four children Zoe, 12, Emma, 8, Eli, 5, and Luke, 4. The family lived in a mobile home in Joplin that was pretty much directly in the path of the rampaging tornado, which blew open the entire house and sucked out Clay and Morgan to send them flying out while still perched atop mattresses “like a waterslide.” Fortunately no one was seriously injured, but it was found that little Eli was missing. After a panicked search they soon found him uninjured around 20 feet from the house, oddly wrapped up in a green rug “like a burrito,” although no one knows who wrapped him or even where the carpet came from. All Eli was able to remember is that he had seen a man with brown hair hovering over him. Other such stories are a little harder to classify, yet they are every bit as strange and perhaps connected. One is the account given by a Pastor Wermuth, who said that something very mysterious had happened at a church that was hit by the tornado during a service. At the time the congregation was quickly whisked off to the basement, but this did little in the face of the breathtaking destructive power of the beast, and the walls of the church came crashing down all the way into the basement. Several people had been pinned under the heavy rock and debris, and then it was reported that suddenly six large men has arrived to lift all of the rubble off of them before saying that they had other people to dig out and leaving. They were not regular rescuers, because when actual rescuers arrived they not only had seen no other people in the area, but also claimed that the collapsed walls would have been far too heavy for 6 men to lift. Who were these strangers? Were these the same guardian angels seemingly watching over the others? There’ll be some that I can’t get to leave me alone. I look at them as my angels. I really do. I think it’s more of a sign that angels were there that night. We were being watched over. The stories about butterfly people coursed through Joplin, passing one by one and then by the many, tales describing what children reported seeing on that Sunday night in May as the tornado bore down. The children said the butterfly people protected them. These stories, tales of guardian angels, could be dismissed as a child’s fanciful imagination. But the stories have taken hold here. And as the months have slipped by, the adrenaline fading along with some of the terror, the stories have assumed a new, maybe even more important role. To understand why, you have to understand what this town of 50,000 went through — and what it still faces. The tornado killed 161 people. It shredded entire neighborhoods. More than 900 homes were lost. Big box stores collapsed. The destruction was complete, the landscape rendered foreign. The tornado unleashed stories about death and unlikely survival: A teenager sucked from an SUV, a toddler plucked from his mother’s arms, houses that exploded in 200-mph winds as families huddled in bathtubs and closets. For months, just about any place people gathered, the stories spilled out, including stories about the butterfly people. What are we dealing with here? Considering that it is children who have reported these experiences it has been speculated that this is all merely a coping mechanism to deal the stress and trauma of what they have been through. Yet how is it that these people have so miraculously emerged unscathed to tell these tales? How do we explain the adults who were also witness to unexplained twists of luck that managed to help them avoid certain death in the face of one of the worst tornados the country has ever seen? Is this all coincidence mixed with a bit of luck, trauma, and the overactive imaginations of children? Or is there something more to it? Could it be that these entities really did come from somewhere beyond our understanding to help, and if so were they angels, aliens, or what? Why did they appear only to children? Whatever the answer may be, the stories of the Butterfly People of Joplin have been persistent, and give a sense of hope, wonder, and light in an otherwise horrific event in history. The road can be a dangerous, deadly place, with cars speeding and careening all over like big heavy missiles of metal, glass, and gasoline, and people often not paying attention to where these rolling projectiles are headed, all made even worse by poor road conditions or visibility, and automobile accidents take a major, tragic death toll on the roadways of our world. It can be a harrowing thought to realize that you are almost at the mercy of fate out there on the road, racing along essentially alone in a thin shell of metal that will likely not do much good to protect you if danger should come calling. Yet what if we are not alone out there on that stretch of road? What if there are benevolent forces watching over us, looking out for us, and guiding us safely to our destination? If some reports are to be believed then this might just be the case, and actual guardian angels may be patrolling the roads and highways just as surely as the specter of death. 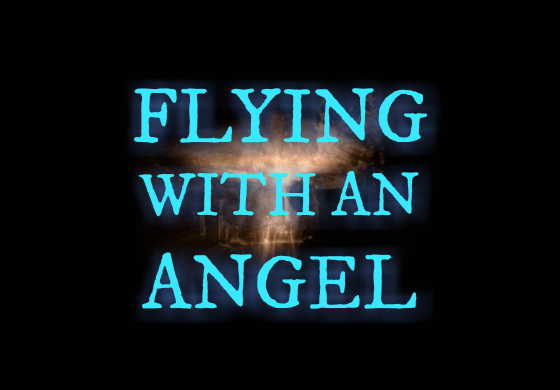 One particularly odd type of report involving angels on the road is that of actual hitchhiking angels, which typically appear out of nowhere to picked up, go on to make prophetic statements or prevent some accident, and then vanish without a trace. Interestingly, there is a very early case of this sort of thing going back all the way to an era before cars were even a thing. This account can be found within a 1602 manuscript held by Linköping library in Sweden rather unwieldy titled Om the tekn och widunder som föregingo thet liturgiske owäsendet, or “On the Signs and Wonders Preceding the Liturgic Broil,” by a scholar named Joan Petri Klint, who wrote much of unexplained events and was sort of an early paranormal writer. Among the many accounts of anomalies and strange occurrences held within the manuscript is a report supposedly given by a vicar of Klint’s acquaintance, who claimed that in February of 1602 he had been travelling to the town of Vadstena by sleigh along with three companions, when they came across a very young woman out in the frosty cold. Considering it was frigid outside and this girl seemed inadequately dressed and lost out in the middle of nowhere they offered her a ride on their sleigh, which she accepted with a nod. Things got very weird when they stopped at an inn for a rest and the mysterious young woman was offered a mug of beer. As soon as the drink was set in front of her it immediately turned to malt, and yet another beer placed there suddenly transformed into acorns. The third and final beer was grasped by this wondrous girl and turned to blood. The girl, who up to this point had not uttered a single word, then proclaimed “There will be good crops this year. There will be enough fruits of the trees. There will also be many wars and plagues,” before vanishing right before their eyes. True to her word, the year turned out to be exactly as she had prophesized. One late night when I was a toddler (20 now) my parents were just cruising around town while I stayed with my grandma. They were young parents and I was their first so I wouldn’t blame them for taking a break from me. And at some point they stopped at a gas station and while they were there, an old homeless man came up and politely asked for a ride. 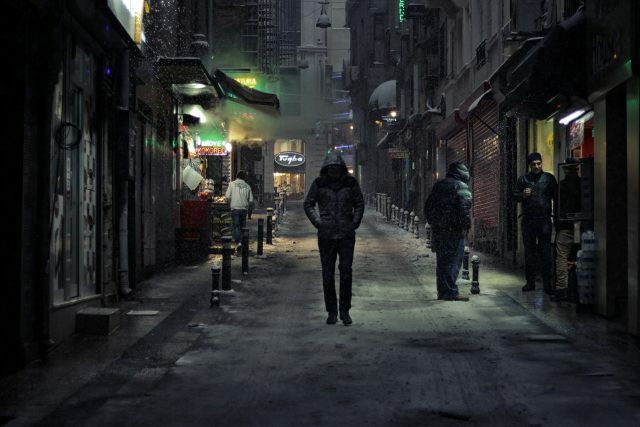 The man seemed harmless and they accepted his request. They were driving along and as they were crossing an intersection at a green light when they saw a car that had blown the red light coming at their side at full speed. But instead of getting t-boned, the incoming car went straight through them. They pulled to the side to make sure everything was okay. They looked in the back to check on the man. But he had vanished. Thought that I would mention the one where the “angel” stops to say that he can’t stay, and his “name is Johnny”. The stranger is real. The truck is coming down the street in an angle to miss the stranger walking in the street.